Experimental Brain Stimulation Relieved Depression Symptoms In Study : Shots - Health News People with symptoms suggesting depression felt better immediately when tiny pulses of electricity reached a brain area called the lateral orbitofrontal cortex. There's new evidence that mild pulses of electricity can relieve depression — if they reach the right target in the brain. A study of 25 people with epilepsy found that those who had symptoms of depression felt better almost immediately when doctors electrically stimulated an area of the brain just above the eyes, a team reported Thursday in the journal Current Biology. Several of the patients talked about the change they felt when the stimulation of the lateral orbitofrontal cortex began, says Kristin Sellers, an author of the paper and a postdoctoral researcher at the University of California, San Francisco. One person's response was: "Wow, I feel a lot better. ... What did you guys do?" DBS is an approved treatment for tremors, including those associated with Parkinson's disease. But results with depression have been less consistent, and DBS isn't approved for this purpose by the Food and Drug Administration. 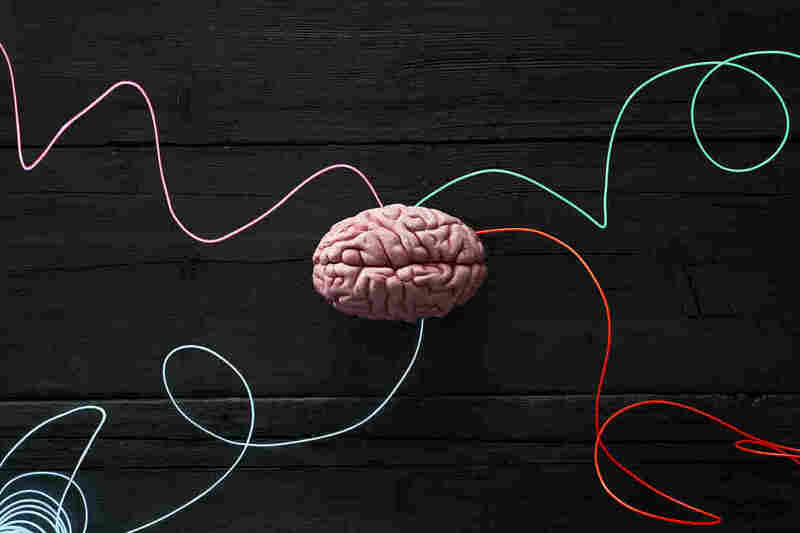 The latest study represents "another piece in a very complicated puzzle, a very important piece," says Dr. Helen Mayberg, a pioneer in the use of DBS to treat depression. The study also offers strong evidence that stimulating the OFC can temporarily improve the mood of a person who is feeling depressed, says Mayberg, who directs the Center for Advanced Circuit Therapeutics, which is part of the Mount Sinai Health System in New York. But it's unclear whether the stimulation can produce long-lasting changes, she says. Also, the study couldn't answer a critical question because it only looked at people who were reporting transient symptoms of depression. "What happens if you did this in people who actually have failed every kind of treatment for a major depressive episode and are chronically and intractably ill," Mayberg says. Meanwhile, her own team has been able to help about 80 percent of those patients by stimulating a different area of the brain — one that happens to share many connections with the OFC. The latest study offers "more evidence that [DBS] is something that is real and will work for depression," says Al Fenoy, an associate professor of neurosurgery at the University of Texas Health Science Center at Houston. Fenoy is part of a team that has had success treating depression by stimulating yet another brain area that shares connections with the OFC. "We're all (working) along a very similar pathway," he says. "One of the common denominators might be this orbitofrontal area." But it's also possible that different types of depression will require different targets, Fenoy says. All of the research on brain stimulation reflects a move away from the long-held view that depression is caused by a chemical imbalance in the brain. "A more sort of modern conception is thinking of depression as a circuit dysfunction, meaning that there's something about the way cells in the brain are talking to each other that is not quite right," says Dr. Vikram Rao, an author of the new study and an assistant professor of clinical neurology at UCSF. "The way that I like to think about it is we're trying to get onto a highway and there's a lot of different on-ramps," Sellers says. The UCSF team took a novel approach to this task by studying patients with epilepsy who were awaiting surgery. That meant they already had wires inserted into their brains to help doctors locate the source of their seizures. In a previous, related study, UCSF researchers had used a different group of epilepsy patients to identify circuits in the brain that indicated whether people were happy or sad. This time, they were able to use these wires to not only monitor various brain circuits involved in mood but also electrically stimulate some of those areas. The researchers were able to use the technique in many different areas in the brain. And Sellers says they got an immediate response when they stimulated the OFC. "What we found was that consistently, stimulation in the lateral OFC was improving mood in symptomatic patients," Sellers says. What's more, more powerful stimulation produced a more dramatic improvement in mood, she says. There were no issues with side effects, including mania, which has been seen in some previous experiments with brain stimulation. That's probably because the OFC offers a really good on-ramp to brain networks involved in depression, Rao says. "It does seem to be a crossroads for connecting many different brain regions that had been implicated in regulating our mood." And Rao says the results suggest that stimulation of this area is improving the function of a faulty circuit, rather than just making everyone happier. "Only the people who had symptoms [of depression] to start with improved their mood, which suggests that perhaps the effect of what we're doing is to normalize activity that starts off abnormal," Rao says. A previous version of this story misspelled Kristin Sellers' first name as Kristen.